As one of the most overworked components in your car, even correct use of the clutch pedal results in inevitable damage. Incorrect or excessive use causes unnecessary wear and tear, which can result in the need for premature clutch repairs. The good news for Brisbane drivers is that you can prolong the life of your clutch by making a few changes to your driving habits. Don’t ride the clutch. Even resting your foot on the pedal can partially engage the clutch. 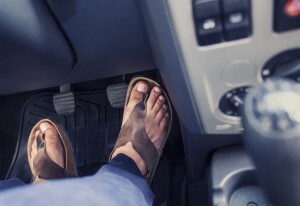 Only use the clutch pedal when you’re changing gears and leave your left foot flat on the car floor in between. Sloppy or aggressive gear shifting puts excess strain on all parts of the clutch. You should not feel any difference in the car’s forward motion when you shift gears properly. Don’t engage the clutch unnecessarily when braking. If you’re stopped at a red light or caught in a traffic jam, put the car into neutral. Stop downshifting. Changing to a lower gear instead of braking is an unnecessary use of the clutch. Brake pads are cheaper to replace than transmission parts so let your brake and your clutch do the jobs that they were designed to do. - Clutch slippage – When a clutch is said to slip, it means that the engine power is not transferred to the gearbox properly. The RPMs will rise but the speed will not. This happens when all the friction material on the clutch plate has worn out. - Noises – A chirping, grinding or humming noise when you release the clutch could mean a warn clutch release bearing. - Trouble shifting gears – If you’re finding it hard to change gears or hearing a grinding sound, the clutch isn’t releasing fully. This could be indicative of a bent clutch fork or a badly adjusted clutch cable linkage. Smells – Too much pressure on a clutch can result in the facings overheating and giving off a burning odour. If you’re experiencing any of these symptoms, you may require a clutch repair. Contact the Brisbane Gearbox and Diff Shop team by calling (07) 3391 8377 for the Woolloongabba service centre or (07) 3808 4055 for our Slacks Creek office. This entry was posted in Clutch, Mechanical Advice by admin. Bookmark the permalink.